Several days ago I’ve written about getting a police clearance in Canada. This post will complement the previous blog post and will benefit the most those who are living in Calgary, Alberta. One of the three ways to get a police clearance in Canada is through the RCMP – accredited fingerprinting agency. 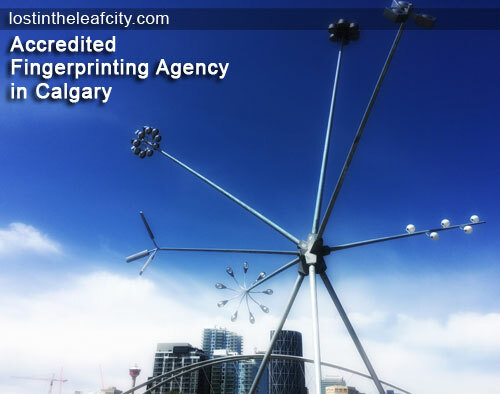 In Calgary, five accredited fingerprinting companies are in business to serve the likes of temporary foreign worker, permanent resident, and student. If you own a similar business or discover an accredited fingerprinting company that is not on the list, take the time to comment and I’ll immediately update the post. I am in no way affiliated to any of the following companies. With that in mind, part of the list is the agency where I applied for police certificate and NBI Clearance. Let’s find out which one is the right agency for you. 1. The Fingerprint Room Inc.
L-1 Identity Solutions (formerly International Fingerprinting Services) is one of the Safran offices. It is located in the Rocky Mountain Plaza, across the Calgary Central Library in downtown. This is where I had a digital fingerprinting for the police clearance certificate (Canada) and ink and roll fingerprinting of the NBI Form No.5 as one of the requirements for the application of permanent resident (Live-in Caregiver Program). Tip: In this same building, a few rooms from L-1 Identity Solutions is where I applied for US non-immigrant visa before I became a permanent resident. Sometimes I’m surprise by how easy to get around downtown Calgary. Everything I needed was located in one place close to my favourite landmarks. 3. ClearNeed Information Systems Inc. This is where the list ends but not the tips. I decided to add the requirements that an applicant has to bring with to avail the services of an accredited fingerprinting agency in Canada. I find it convenient to use my Philippine passport and Class 7 learner’s license whenever I have to show any proof of identification. A little sidetrack: I encourage you to have a Class 7 Learner’s License once you settle in Canada even if you don’t plan to drive soon or have no plan at all. A driver’s license is always handy in accomplishing immigration-related documents. The City of Calgary is growing and in the future, I am looking forward to update this post for all of the residents of Calgary, saving them time to complete the list of requirements. Which of the fingerprinting companies you’re planning to visit or already have gone to? Share your experience. Thanks for the info! The RCMP website no longer maintains a list of accredited agencies. One to ad would be the Comissionaires, they are Canada wide and located in the NE, more convenient for Calgarians on the north side of the river! Thanks for the suggestion. I already updated the post and the RCMP link. . Thank you so much for this post! I used it to find San fran Morpho. With out this guide I probably wouldn’t have gotten my fingerprints taken care of so quickly. Your welcome Nikolas! Glad you save time and effort.